Situated in the Mountain Region, Wyoming is the least populous state and the second least densely populated state. At 253,600 square kilometers, Wyoming is about half the size of Spain and slightly larger the UK. Bordered by Montana, South Dakota, Nebraska, Colorado, Utah, and Idaho, the state had a population of about 250,000 people in 1940. About ten percent of the Wyoming’s men served in the Armed Forces, but the state played many more roles during World War II. Army Air Bases: The Army Air Force (the Air Force separated from the Army in September 1947) established numerous airfields for training fighter and bomber pilots and air crews. The two major fields were located in Casper and Cheyenne. The fate of the bases is varied. Some became municipal airports while others were retained by the Air Force. Some were left to go back to the agricultural fields they had been. Meanwhile, the hundreds of “temporary” buildings still survive. 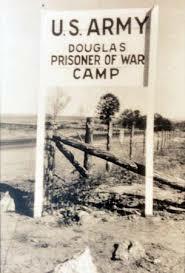 Camp Douglas POW Camp: From 1943 to 1946, the camp of 180 buildings housed Italian and German prisoners-of-war. Very few of the buildings remain, but the Officer’s club still stands. Inside the walls are covered in murals depicting western life and folklore. Painted by three Italian prisoners, the murals are now on the National Register of Historic Places with the National Park Service. The installation of the camp created a housing shortage for military personnel (not housed in the camp), so most residents of the city rented out rooms. In addition, because of the number of men who left to serve, there was a shortage of workers in the agricultural industry. Therefore, the some of the prisoners were used to fill the void. At its peak, the camp housed more than 3,000 inmates. Heart Mountain Relocation Camp: Many people are aware of the internment of Japanese citizens from the west coast states, but did you know there was a large population of Japanese, Italian, and German folks in Wyoming? Forced to register and carry photographic identification cards after the attack on Pearl Harbor, many of these people eventually lost their jobs. According to one article, railroad employees were fired, but miners continued to work. (Did no one else want the job? Did the government decide they couldn’t do any harm working deep in the mountains?) Eventually the Japanese were evacuated to the Heart Mountain Relocation Center located between Cody and Powell. Japanese from California were also transported there. The camp closed November 10, 1945, more than three months after the end of the war. 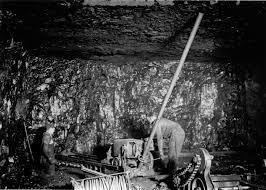 Mining: Coal mining in Wyoming commenced in 1867 with the arrival the Union Pacific Railroad. Coal was necessary to power the locomotives. Working this hard, dangerous job thousands of miners lost their lives from explosions and fires. In the early 1900s laws were passed to ensure worker safety. Coal had many uses, and its demand skyrocketed during WWII. Wyoming also mined iron and produced oil for the war effort. A beautiful state with a proud history. Have you ever visited?